Barton Shields, the co-founder and CTO of Olympus Sky, speaks exclusively for the Cyber Security News Service and introduce their ODSP solution, a complement to PKI that is designed specifically for the automotive industry. What do you think are the most critical issues of developing secure connected cars? I think the problem is the designing and implementation of secure communication for the in-vehicle networks as well as connected transportation. For example communication between ECUs, particularly, sensor hubs to intelligent ADAS sensors, or especially for connected transportation (V2I, V2V or V2X). I think that PKI (Public Key Infrastructure) is not going to be appropriate for any of these – they have been trying to make PKI work for 8 years in trials but they are still having problems. That is not surprising due to a number of inherent problems with a solution like PKI, especially with having to deal with certificates. Olympus Sky takes into account the requirements of secure communication between ECUs, particularly, from sensor hubs to intelligent sensors while developing a solution specifically for the automotive industry. I can say that we are now working with several major players in the automobile and security industry and our goal is to turn our solution into a standard. Could you give us an introduction about Olympus Sky and the solution that it offers? Olympus Sky is focused on providing link security products that are based upon a low latency, low complexity, high entropy, novel solution for link security. Our Organically Derived Synchronized Processes (ODSP) Ciphersuite Selection & Cipher Key Generation Cryptographic Management Architecture avoids sharing of any information or secrets prior to entering into the bulk encryption phase because each side of the link is able to organically generate their own secure key. This solution can operate over any medium and can be integrated into any layer of the communication stack; addressing everything from V2X and V2I all the way down individual connections across the IoT. This solution is truly made for the Internet of Everything (IoE). 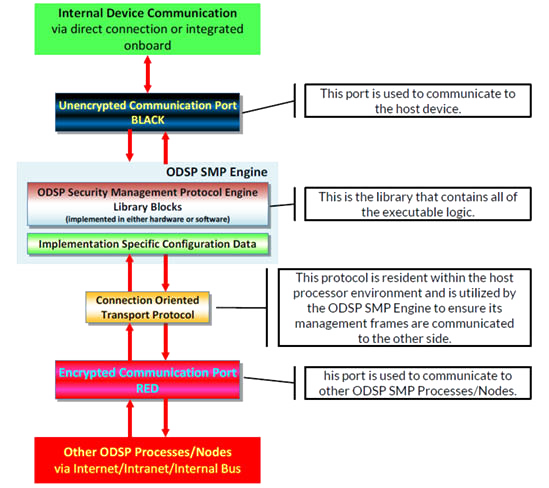 This is a block level diagram of the ODSP Security Management Protocol (SMP) Engine. The ODSP SMP Engine is the central element of an ODSP SMP implementation, with the major blocks of the ODSP SMP Engine shown in the diagram on the left. The core concept and assumption of the ODSP SMP Engine is that it is assumed to be functionally and practically, viewed as a “Black Box”. The diagram below provides a graphical view of the ODSP SMP communication and functional layers used by the Management Channel for communicating non‐payload related data between ODSP SMP Processes/Nodes. How is Olympus Sky differentiate its solution from other alternative solutions like PKI? Although a comparison is made between ODSP and PKI, ODSP does not attempt to compete against PKI. It is a complement to PKI in areas for which PKI is not deemed appropriate. No methodology in any field can be all things to all applications, but unfortunately, people have increasingly attempted to do that with PKI. PKI has its place and does a very good job in most situations; but there are many others in which even if it can be made to work, it will not be an optimal application of PKI. This is the market for which ODSP is meant to address and this is the context in which ODSP should be considered. Olympus Sky is looking for partners to help make ODSP an open source, license free, security solution for automotive and IoT applications.